How often do you get personalized body care products which are specially catered to address your skin? I believe 90% of us will just buy the commercial type of bath products from supermarkets, but I am pretty sure that you'd change your mind after you have tried the organic handmade soap from Yuan Soap (阿原肥皂). Honestly, I only started to appreciate the goodness of natural soap after I had once experienced itchy and uncomfortable skin due to my skin sensitivity towards overly strong shower gel. Slowly I learn how the natural flowers, plants, roots, leaves and stems are able to benefit the skin. From the Flower Series, Alpinia Speciosa is part of the Ginger family, otherwise known as Shellflower. Alpinia helps promote collagen production, hence slowly your skin will feel healthier, firmer and younger looking. Also from Yuan Flower Series which are made with high anti-oxidant properties oil such as avocado oil, wheatgerm oil and olive oil, this is more suitable for my Mom and Aunt. It works well on mature skin, and helpful for those undergoing menopause. 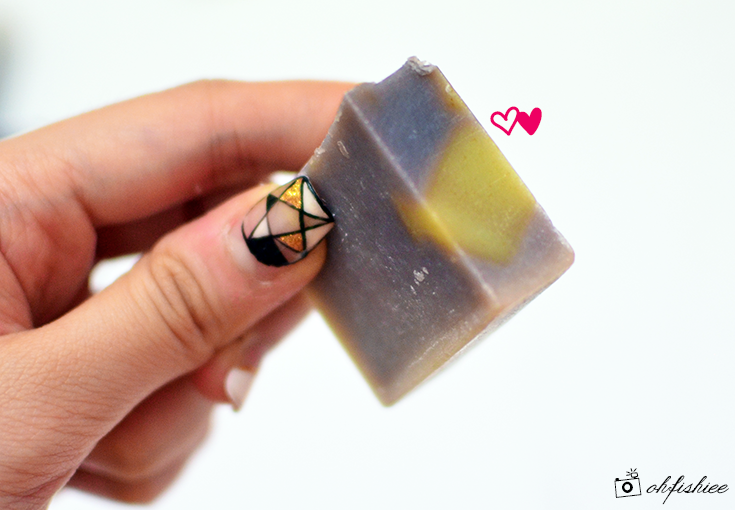 They will be happy to use this soap to prevent age spots, wrinkles and dry skin conditions! Third is my personal favourite: A great detoxify-er which helps to unearth impurities deep within the skin. So if you have acne-prone skin or blackheads and whiteheads, it's time to put a glow to your dull skin. All in all, this soap from Herb Series is best to cleanse, nourish and refresh the skin. Some may say the quality is inconsistent in terms of aroma, color and appearance. But that's what I like about Yuan Soap -- 100% handmade with love, using the most natural resources without preservatives, colourings and artificial fragrance. I use only half a bar as bodywash, and personally I find it easy to lather and wash off after that. The strong herbal flavour is quite pleasing to me, not as "medicinal" as I thought. It feels more refreshing and soul-soothing after bath! ❤ Highly recommended for teenagers and young adults. As a banana, I tend to avoid using products with Chinese names that I can't read. However, this looks like a good recommendation to use products that are customised to out own skin types. Thanks for sharing. wow nice Yuan soaps, always been wanting to try them. But the price always pull me back. This is so outstandingly beautiful!~ I think it's extra nice, right? I have also started using mineral -based soaps only. The packaging looks very beautiful that it looks like collectibles. I pun guna tapi bukan brand ni.. I love handmade soap. I make them sometimes though it could be slightly a hassle to purchase the raw materials. Natural soaps are good for skin and these Yuan soaps looks nice too! always love to try something natural, wont harm our skin! These soaps look amazing babe. Love the packaging that it came along with it as well :) Gorgeous shots! Nice, interesting to see more and more custom made soaps appearing in the market.